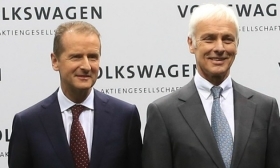 VW brand CEO Herbert Diess (left) with VW Group CEO Matthias Mueller. MUNICH -- Volkswagen Group is planning to replace CEO Matthias Mueller with Herbert Diess, the head of the namesake brand, people familiar with the matter said. The change will be discussed at a supervisory board meeting on Friday, said the people, who asked not to be identified speaking ahead of an official announcement. A VW spokesman could not immediately be reached for comment. VW said in a statement on Tuesday that Chairman Hans Dieter Poetsch is currently in discussions with top executives and supervisory board members about management board changes and that Mueller, 64, has "showed his general willingness to contribute to the changes." The release did not provide any specifics. In tapping Diess for the top job, Volkswagen would elevate a senior executive from its own ranks, while at the same time relying on a relative outsider to run the company. Diess joined VW from BMW Group in mid-2015, months before the diesel crisis erupted. As the executive overseeing VW's biggest unit, he routinely butted heads with the powerful labor union as he sought to cut costs and simplify the carmaker's structure. Diess's potential promotion would be good for VW, one analyst said. "We believe that if Diess is confirmed as the successor, VW shares will extend their gains. Investors will like his strong execution track record and his understanding of mobility 2.0," Evercore ISI analyst Arndt Ellinghorst said in a note to investors. "Put simply, we see no better alternative to Matthias Mueller to make the company fit for the future by dealing with some of the legacy businesses as well as making the right investments in future technologies." Ellinghorst added that he expects Diess would keep his job as CEO of the VW brand while also overseeing the VW Group. In the aftermath of the diesel-cheating scandal, VW has been pushing to overhaul its rigid top-down management structure, delegating more responsibility to its brand and regional chiefs. Its complex structure has extended to its main shareholder, Porsche Automobil Holding, where VW's chairman serves as the CEO and Mueller also serves as a top executive. Porsche said separately any changes at VW would have a knock-on effect for it. Including Mueller, VW's management board totals nine people, with responsibilities ranging from purchasing to legal affairs to financing and human resources. Meanwhile, Audi, the VW brand, the trucks division and the group's Chinese operations also have representatives on VW's top executive body. "It is currently open whether the considerations and discussions will lead to a further development of the management structure or to personnel changes," VW said in the statement. Representatives of Porsche and the German state of Lower Saxony, VW's two largest shareholders, weren't immediately available for comment.